Are you experimenting with some fun, creative, yet cost-effective promotional tokens to lure customers? Then probably you haven’t employed a custom 5.25 x 8 round corners full color calendar magnet, which has worked for all small budget marketers. 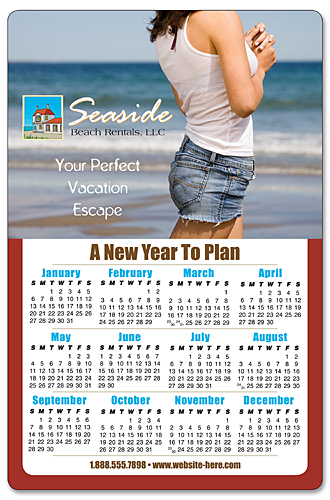 A promotional 5.25 x8 round corners full color calendar magnet can easily show up from refrigerator doors or working cabinets due to its prominent shape. Restaurants, luxury lifestyle stores, healthcare marketers, individual businesses – can reap benefits from this kind of calendar magnet because people will retain them even after a year ends. A personalized 5.25x8 round corners full color calendar magnet can be handed out as an acknowledgement token or greeting token or it makes a great mail out in a New Year. Product Size : 5.25 in. x 8 in.